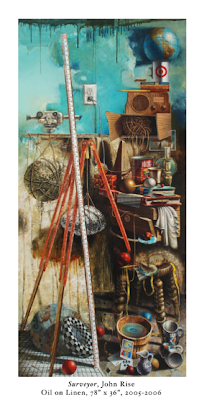 The Cecelia Coker Bell Gallery presents John Rise, a painter and draftsman based in Savannah, Ga., for the gallery’s third show of the season. Rise’s exhibit of paintings and drawings opens Oct. 21, with a reception and a presentation by the artist in the Cecelia Coker Bell Gallery from 7 to 8 p.m. Light refreshments will be served, and the reception is free and open to the public. The show is on view through Nov. 15. Many in the art world know Rise as the inventor of a stretcher bar system for painter’s canvases. Students at Savannah College of Art and Design appreciate him as an award-winning teacher of drawing. Others know him as a painter and draftsman who values, in equal measure, finely honed artistic skills and intellectual depth. 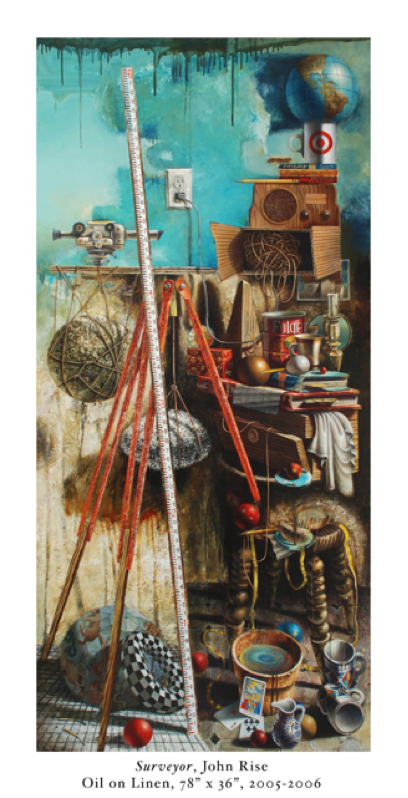 Painting from direct observation, Rise typically offers complex compositions filled with a variety of discarded and repurposed objects. They include both the odd and the familiar; some are symbolic while others are mundane; some are valuable while others are valueless. “My work intends to call forward and question associations and relationships, both formal and literal, traditional and contemporary, universal and personal,” Rise said. Rise, who will also be judging the Coker College art club’s annual competition, received his Bachelor of Fine Arts in drawing from Arizona State University, and his Master of Fine Arts from the University of New Mexico. He started Best Artists Products, a company that designs, manufactures and distributes canvas stretcher bar systems, wood screenprint frames and hardwood artist easels. He sold the company in 1995. Rise has taught drawing and painting classes at the University of New Mexico and, since 2005, has taught drawing at Savannah College of Art and Design where he was awarded the 2010-11 Vulcan Materials Company Teaching Excellence Award for his outstanding contributions to undergraduate education, student learning and campus life. The Cecelia Coker Bell Gallery is located in the Gladys C. Fort Art Building on the Coker College campus. Gallery hours are from 10 a.m. to 4 p.m., Monday through Friday, while classes are in session. For more information about the gallery, contact gallery director and assistant professor of art Larry Merriman at 843-383-8156, lmerriman@coker.edu or visit http://www.ceceliacokerbellgallery.com/. innovative service to the Pee Dee region, which it defines as the following counties: Chesterfield, Darlington, Dillon, Florence, Lee, Marion, Marlboro and Williamsburg. To have your event, program or project promoted by Pee Dee Arts, send an email with detailed information to peedeearts@gmail.com.